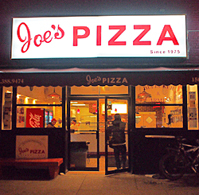 Joe's of Carmine St. is probably the best example of a New York-style slice. So, when I noticed they had opened a second location on East 14th Street, near Trader Joe's, I had to give it a shot. While an expansion could spell the downfall of an established brand, I must say the pies at the new location are as good, if not better than the original. Start with a regular slice. Nine-out-of-ten times it will be piping hot fresh from the oven. The thin crust has a nice char and is topped with loads of gooey mozzarella. 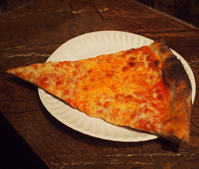 It is one of my favorite slices in the city and is perfect for lunch, dinner or late-night snack. 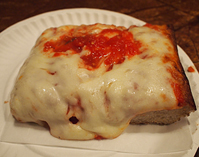 The Sicilian slice is also a winner. The crust is about an inch thick with a crunchy bottom and pillowy surface. It's topped with the simplest of sauces. The tomatoes taste as if they had just been plucked from the vine. Mozzarella is dripping down the sides. Yes, it is a bit messy, but a delicious one. The shop is also selling a number of specialty pies. We spotted one topped with slices of tomato and basil, fresh spinach, pepperoni and a white cheese pie. But in my book, the regular cheese slice is still the best!